I think it's time for a meal that makes you feel all cozy and comfy indoors. Onto something more positive and perhaps comforting, in an effort to recycle good recipes I've shared on here, I used leftover roasted kumara fries from THIS POST, mashed it up and mixed it with some feta and creme fraiche, and then placed them inside some fresh home made pasta sheets. Now I can't for the life of me remember whether I made enough pasta sheets that would serve 2 people or 1 person. 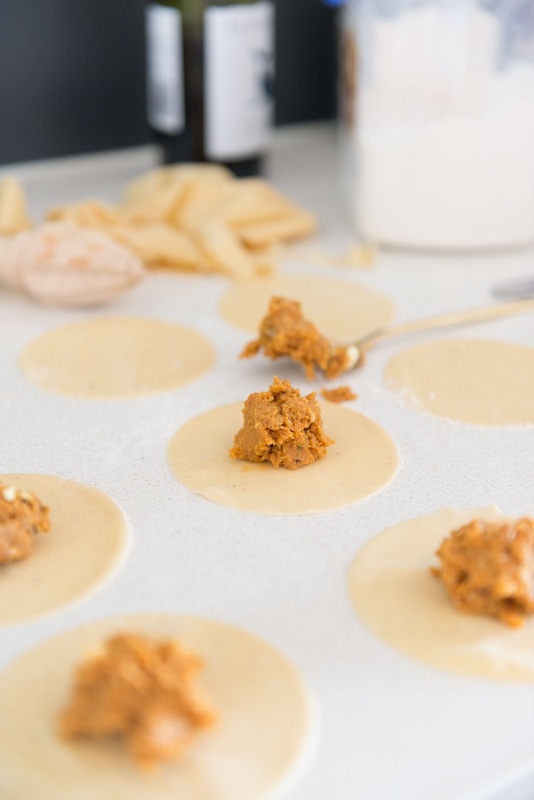 So I have just given you an indicator for 1 person's lot of pasta sheet (and you may have leftover kumara mash). Double the ingredients if you are making for 2. Easy! 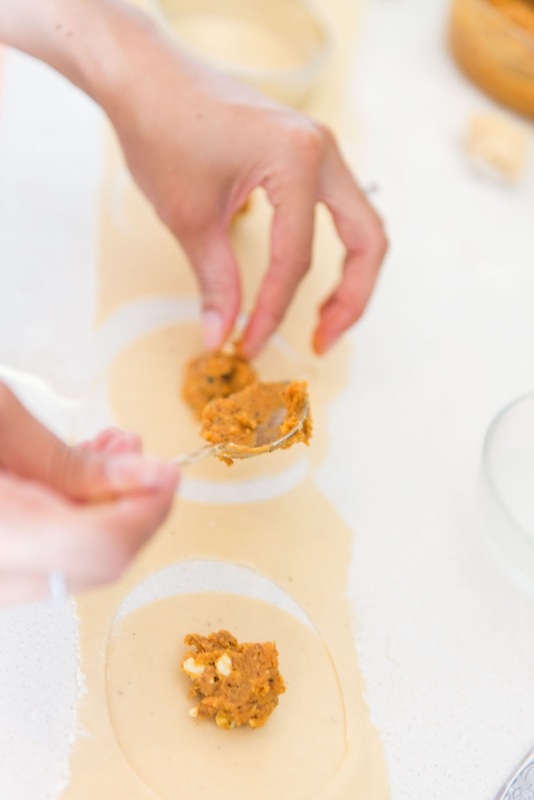 (1) Mash up the roasted golden Kumara with a fork, or better yet with a food processor. 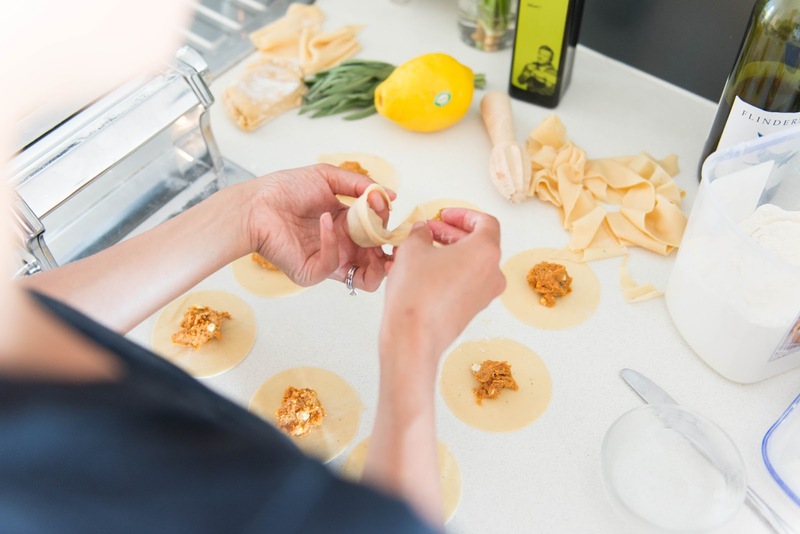 (2) Either with your fork or with the food processor, mash together the Feta, garlic oil, egg yolk, and a couple teaspoons of water to loosen up the paste. 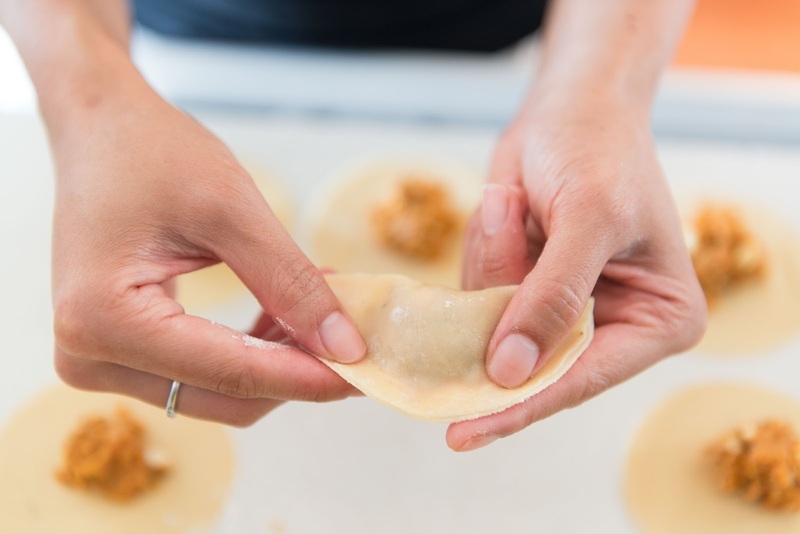 (3) Stir through enough creme fraiche until the filling is to your taste and texture density. Then set aside. 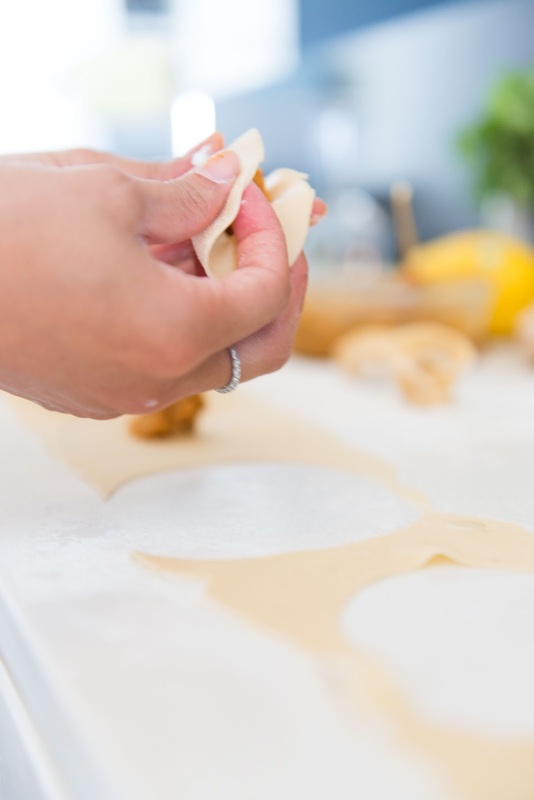 (1) Place the plain flour into a large bowl and make a well in the middle. 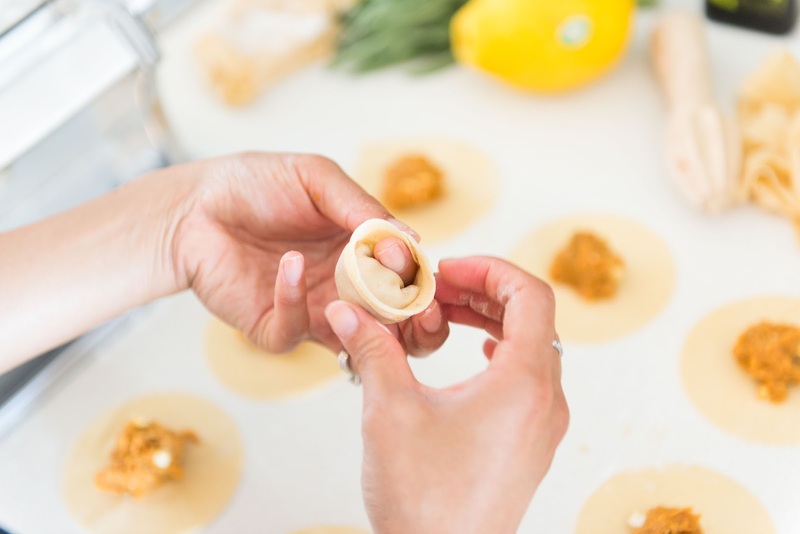 (4) Now I highly recommend you have a pasta machine where you can roll the pastry out to as thiiiiin as possible (i.e. 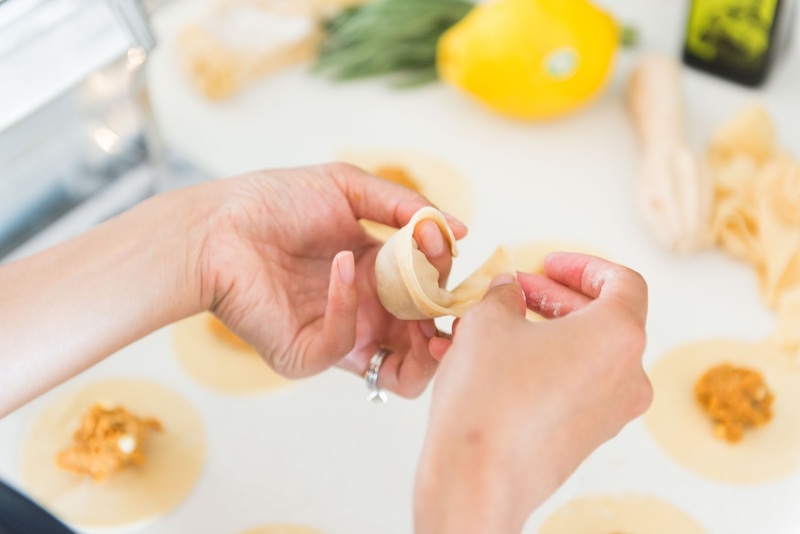 setting 1 on your pasta machine). 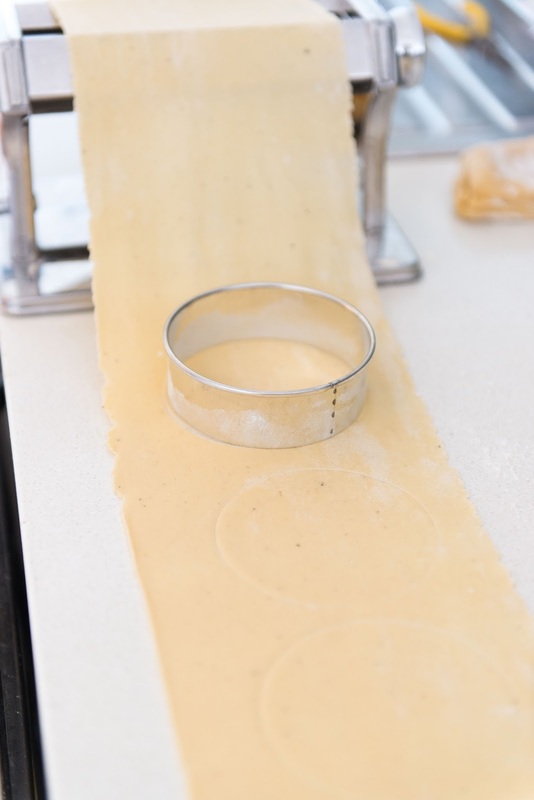 Once you have passed the dough through the pasta machine until you have lone long thin strip, cut out 10cm circles. 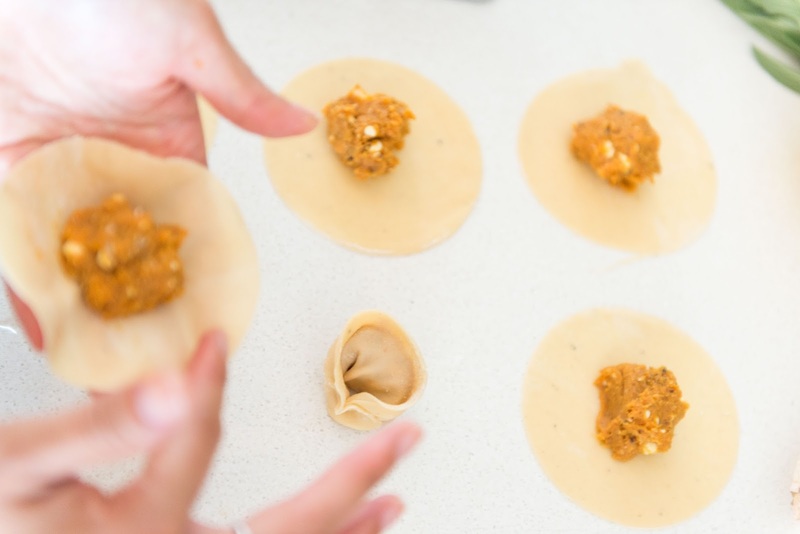 (1) Place your Kumara filling (about a teaspoon) into the centre of the circle, wet one half of the circle with a bit of water and then fold the pasta pastry in half over the filling. 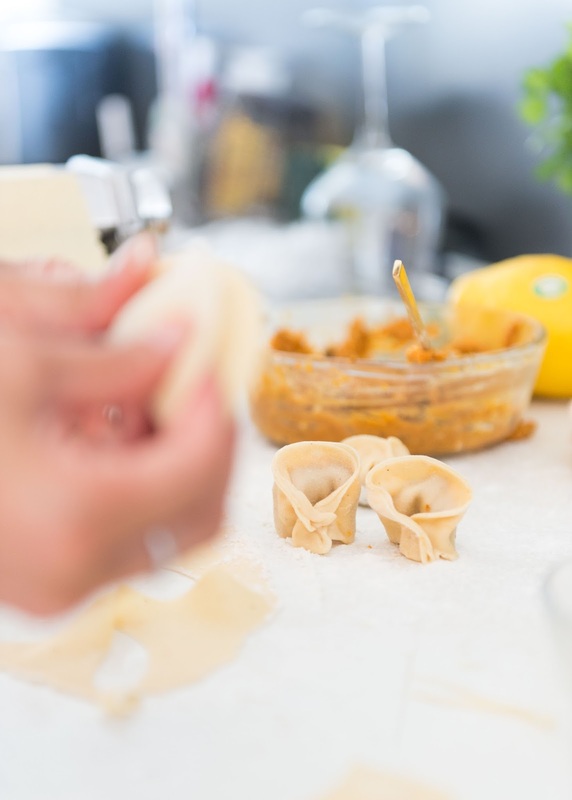 (2)You can simply leave your tortellini to be a half moon, or you can be fancy and bring the two ends of the moon to the front and pinch the pasta close. 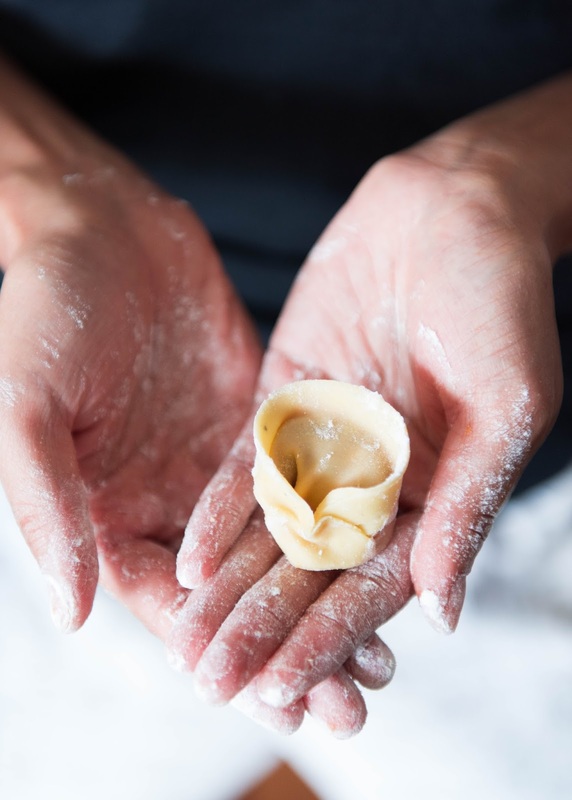 Continue until you have the amount you want to eat, or continue until you've run out of pasta and freeze the tortellini that you won't be eating. (1) Place a large saucepan of water on the boil with a generous pinch of salt and dollop of olive oil. 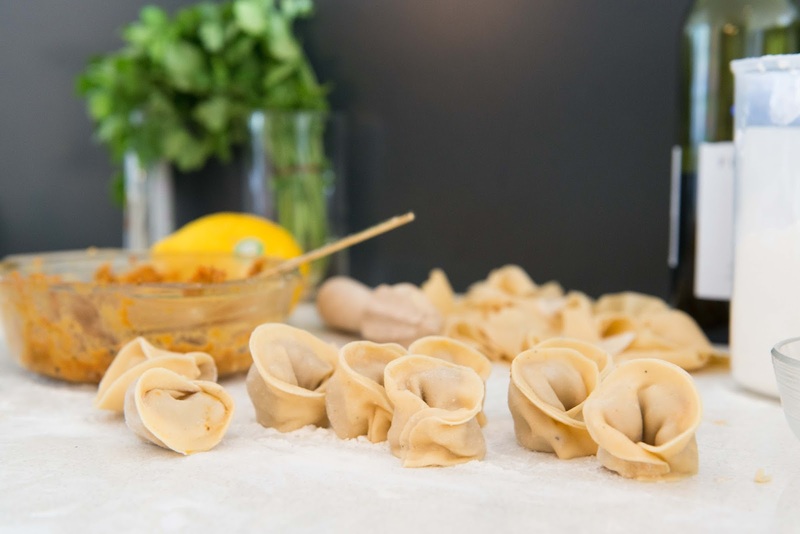 (2) Once water is boiling, slowly drop however many tortellinis you wish to serve into the hot water (perhaps 5 at a time). They are cooked when they float! Spoon them out into a large bowl (or your serving dishes) once they gone afloat and reserve about a cup of the pasta water. 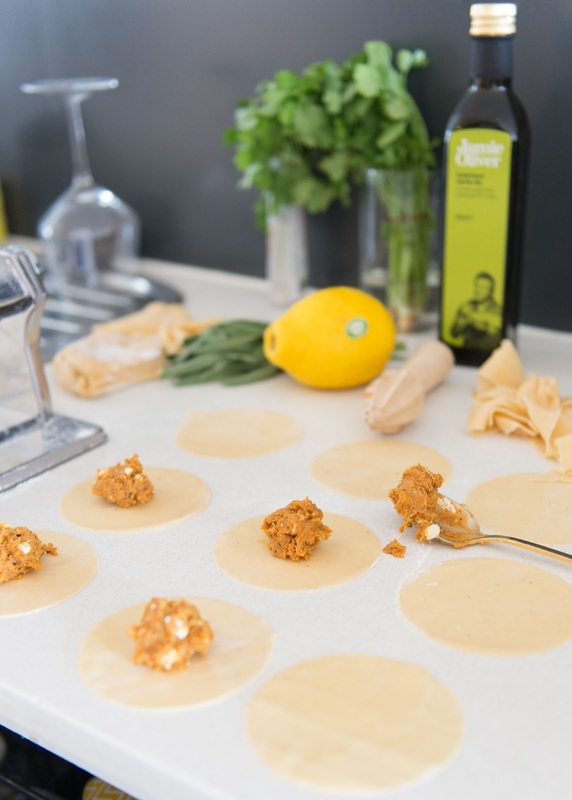 (3) While the Kumara tortellinis are boiling away (which shouldn't take too long at all), place the butter in a wide saucepan/frying pan on medium heat and let it melt until it gets to almost the stage where it turns from melted yellow to translucent. (4) Place your sage leaves flat onto the butter and watch the butter go from translucent to a nice golden nutty brown colour. 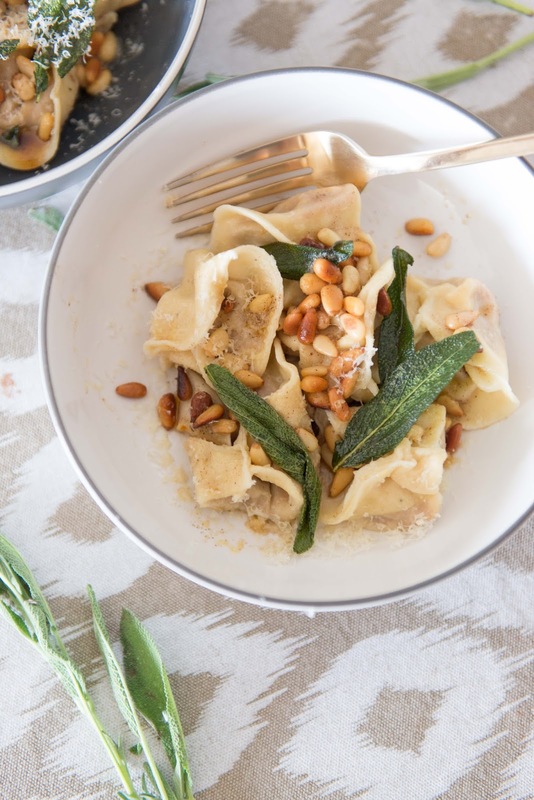 (1) Place your cooked tortellini dumplings in a dish/shallow bowl then spoon over the brown butter & sage sauce. (2) Sprinkle over some toasted pine nuts (optional) and season generously with Parmesan and Salt & pepper! Now chalk it up to bad photography timing and also being a rookie, but my hot tortellini babies sucked up all the brown butter sauce and so it doesn't look very present in these photos. Guess I'll have to reshoot it another time, but I couldn't wait any longer to post this recipe up, I shot this back in November! 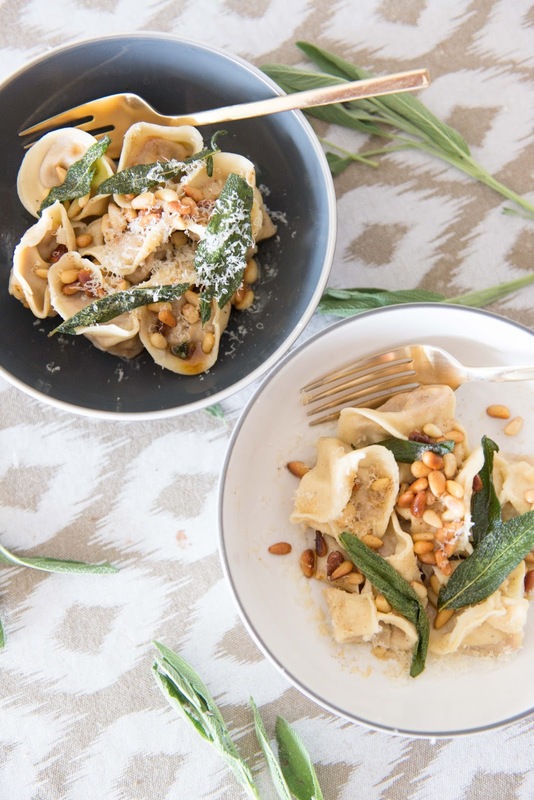 If you're going to try this recipe though, it definitely needs a sauce, and there is nothing better than to pair it with a nutty, herby, buttery sauce like the brown butter & sage sauce, with lashes of parmesan shavings!